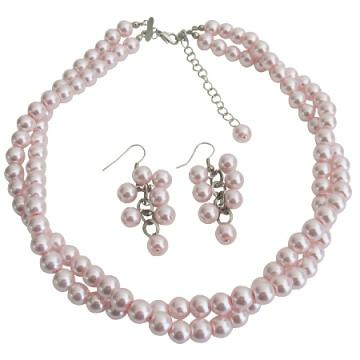 Twisted pink pearls necklace with grape earrings set is a classy and elegant jewelry for bridesmaid & brides to be. It is gorgeous and it boasts a ton of flawless & luminous pearls. This item in Traditional Necklace Sets category was first added to our catalog on 08-06-2014. Buy Wedding Bridesmaid Bridal Jewelry Stunning Pink Pearl Twisted , sold & shipped by Fashion Jewelry For Everyone where you can shop online for Leading Online Retailer for Indian Fashion Jewelry. This Necklace Sets collection has been tagged as statement necklace,bridal necklace set,wedding jewelry,bridesmaids,inexpensive pearls necklace,two stranded jewelry,pearls ornaments,mothers day gift set,fashion jewelry.